Cover art for the 1986 Viking hardcover first edition of Leaving Home by Garrison Keillor. Illustration by Peter Thorpe. 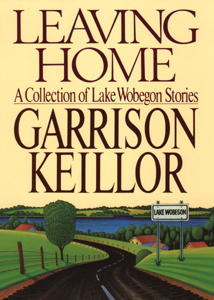 Cover of the 1986 Viking hardcover first edition of Leaving Home by Garrison Keillor. Illustration by Peter Thorpe. The Viking hardcover first edition of Leaving Home by Garrison Keillor was released in 1986. Design Director: Neil Stuart. Design: Neil Stuart. Illustration: Peter Thorpe. Leaving Home point of purchase poster are for sale here. A very rare poster used to market the book, never sold to the public.